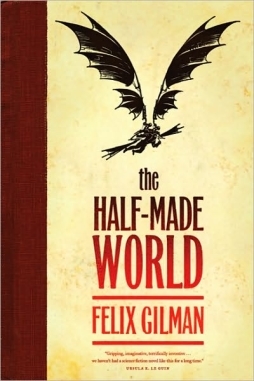 I want to write about the novels of Felix Gilman, who I believe is one of the strongest new novelists in fantasy fiction today. 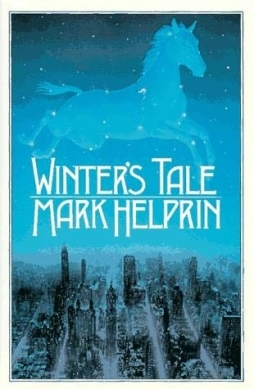 He’s written three books, Thunderer, Gears of the City, and The Half-Made World, all of them accomplished and powerful, fusing imaginative range with a compelling style and real insight into character and voice. 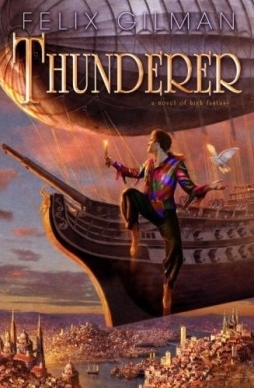 I’ve written about Thunderer on my own blog, and was able to interview Gilman at the 2009 Worldcon. I’d like consider now all three of his novels, and what makes them work. Before trying to describe the virtues of these books in detail, though, I think I first need to write a bit about steampunk. I need to write about the genre because it’s a form that seems to me to be intrinsic to Gilman’s work; or, put another way, I think Gilman’s work illustrates something of what’s remarkable about steampunk. To explain that, I need to explain steampunk, and what it means to me. As it happens, I’ve seen a couple of essays lately which criticise steampunk on various grounds, so I want to consider these objections as a way of defining exactly what steampunk means, and where I think Gilman’s work fits in with it. I’m starting here because this raises the question at once: does steampunk really need steam? And along with that: does it necessarily need to be “Victorian”? I think the answer to both questions is ‘no’. Steampunk was a term coined by K.W. Jeter in a letter to Locus magazine in April 1987, to describe the historical fantasies being written by James Blaylock, Tim Powers, and Jeter himself. Powers’ The Anubis Gates is therefore one of the founding works of steampunk, and as most of it’s set in 1810 (27 years before Victoria took the throne), we can say that steampunk also covers the Romantic era as well as Victorian times. I think that makes sense for the same reason that I don’t think you need steam technology to be explicitly shown in a steampunk story. I think the ‘steam’ in steampunk refers less to steam power (which was after all discovered by Hero of Alexandria about 2000 years ago) than to the age of steam, and thus to the industrial revolution that lasted from the late 18th to the early 20th century. Industrialisation, and therefore steam, reshaped society during those years — where people lived, how they lived, what they wore, how they worked, everything. When you read William Blake writing about “dark Satanic mills”, when you read Percy Shelley urging the working poor of England to revolt (“ye are many — they are few”), you’re reading poetry shaped by steam. Not directly, not writing about technology itself; but the technology was harnessed in certain ways by certain people, causing major changes in society, and that’s what those writers are reacting to. I think the same thing should hold true for later writers reimagining that age. That’s why Jeter’s term works. Steampunk is, implicitly, about industrial processes; about what steam did to the world. Before going on with Valente’s objections to steampunk, I want to turn to Charles Stross, who had a post on his blog about steampunk and its issues a couple of months ago. I have some quibbles with the history in his post (I don’t see any way to support the claim that “‘king’ is a synonym for ‘hereditary dictator’”, especially when we’re talking about industrial-era monarchs), but he was essentially writing about his desire to write a “mundane sf” steampunk epic from the point of view of the colonised instead of the colonisers. That’s fair enough, though I wish his suggested approach had been broader; one can equally well imagine a steampunk story based on the experiences of countries like Ethiopia or Siam (as it then was), which successfully resisted colonisation by Europeans, negotiating technology, politics and culture in the process. But Stross seems to imagine steampunk as inherently about the European experience (and predominantly the anglophone experience) of industrialisation. This doesn’t seem to me to be accurate. Steampunk seems to have a significant presence in Japanese anime, in works by Hayao Miyazaki and Katsuhiro Otomo, among many others. 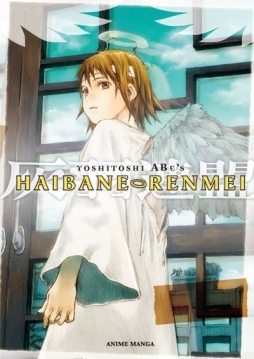 It can significantly inflect a charming work like Haibane Renmei (Charcoal Feather Federation). I think that’s significant because Japan’s another country that had a dramatic experience of industrialisation. A highly unusual one, too; after being forced to open itself to trade in the 1850s, it went through a rapid and radical industrialisation. In fifty years it went from an agricultural feudal state to becoming the first Eastern country to win a major war against a modern Western power (Russia). Valente argues much the same point, claiming that steampunk is “inherently nostalgic, conservative, and comfort-oriented.” I don’t agree with these assessments. At least, it’s not something I recognise in the steampunk fiction I read. I’d argue the opposite, in fact; steampunk is inherently destabilising, it seems to me, overturning accepted verities about historical process by reimagining the past and re-examining past narratives — whether narratives of scientific progress or simply narratives about science. I think steampunk is a way to approach industrialisation; a way to re-imagine the incredible shift from an agricultural society to an industrial society. I think it’s a way to come to grips with the dislocations of the nineteenth century, whether consciously or not. And I think mostly it’s critical of the era it’s reinterpreting. This may be a function of individual reading tastes. When I think of steampunk, I think of Powers, of Michael Moorcock’s Warlord of the Air, of Gibson and Sterling’s The Difference Engine, of Neal Stephenson’s The Diamond Age, of Ian R. MacLeod’s The Light Ages, possibly of Alan Moore’s League of Extraordinary Gentlemen, maybe of Susanna Clarke’s Jonathan Strange & Mister Norrell, maybe of Mark Helprin’s A Winter’s Tale, certainly of China Miéville’s Perdido Street Station. I don’t necessarily value all of these equally highly, but they seem generally aware of class, race, and gender hierarchies, of the historical material they’re working with. I don’t know what books Valente and Stross have in mind when they speak of steampunk; that might make a difference. For example, Stross suggests that steampunk “purports to be science fiction, of a kind … doesn’t it?” I don’t think it does. I think the impulse to steampunk is essentially fantastic. Looking at the list I mentioned above, I notice that an awful lot are explicitly or implicitly fantasy stories. In general, I think that if you’re trying to rework or escape from the industrial age, the age of the machine, of brutal reason, then it is almost necessarily to magic and fantasy that you’d turn. I think that steampunk alternate history almost always has the effect of making the world more fantastic, even when not explicitly a fantasy; it makes things more numinous, and it may be that this gets mistaken for nostalgia. I can’t agree with Valente’s assessment of adventure novels. Again, it depends on what you mean by ‘adventure novel’, but even setting the bar as high as possible, adventure novelists would include Robert Louis Stevenson, Jack London, Sir Walter Scott, Victor Hugo, Umberto Eco (admittedly, a literary novelist using the adventure form, but if the form of the adventure novel is there, is he not an adventure novelist?) — a lot of very good writers. I’m generally uncomfortable with the dismissal of whole genres, and I don’t think the argument here is tenable. So my argument is that even if we accept that steampunk is adventure fiction, that`s not necessarily a problem. An interesting question, though, might be: if steampunk is adventure fiction, more so than fantasy and science fiction in general, why is that? What makes steampunk adventurous? I think there actually may be some reasons for it. If steampunk is an industrial fantasy, then in some sense it’s about systems; about a world seen in mechanistic terms. If it’s a subversion of industrialisation, then by extension it’s also a subversion of systems. The first critics of industrialisation were the Romantics — Blake, Shelley, Byron, the people Tim Powers wrote about in The Stress of Her Regard. So the romantic hero is the obvious figure to turn to if you’re writing a fantasy of industrialisation that subverts the industrial systems. If the romantic hero overcomes the systematisation of the machine age, then the hero(ine) can also maybe be seen as the displacement into the industrial age of the values of the older agricultural systems. In that sense, perhaps, you could call steampunk nostalgic; that is, to the extent it upholds traditional heroic values and actions against the modern world. But then again, you could also say that it follows a long precedent in fantasy in so doing. That’s my general sense of steampunk, anyway. 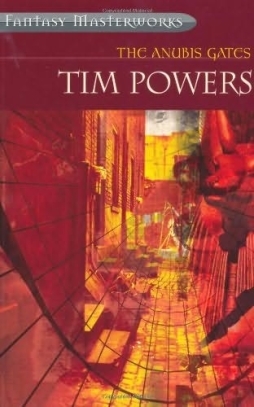 Sometimes it sticks closer to reality, what you might call “low” steampunk (like Tim Powers’ work); sometimes it invents a new world, as in Miéville’s fantastical Bas-Lag, a “high” steampunk. 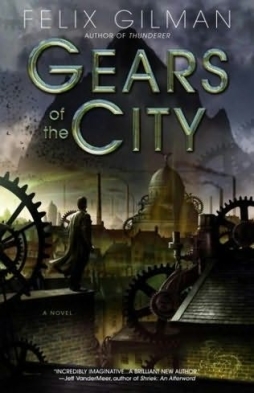 I use the words “high” and “low” not because of any value judgement — I actually prefer The Anubis Gates to Perdido Street Station, personally — but because I want to suggest that steampunk has a kind of inherent pull away from history. Even to the point of creating a new world. Which finally brings me around to Felix Gilman, who writes high steampunk and writes it incredibly well. His first two novels, Thunderer and Gears of the City, are a duology. But they’re also very different books. 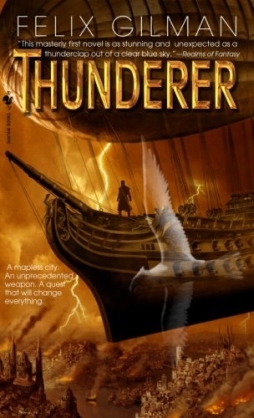 Thunderer introduces us to the city of Ararat, an infinite megalopolis haunted by an endless array of Gods, many half-forgotten or dwindling to nothingness. To Ararat comes Arjune, a believer in the Voice, a God from the southern lands that has vanished from its worshippers’ ken; he’s looking for it in Ararat, and his quest will involve him with, among others, encyclopedists, outlaws, a cross-dressing lawyer, and a God-fueled airship. Gears of the City follows Arjune later in life, when, having learned much, he unriddles some of the city’s most terrible mysteries. 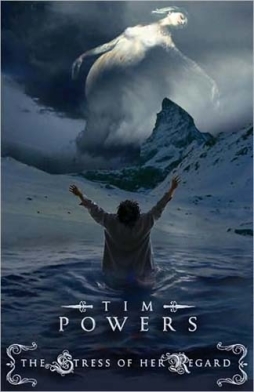 The first book seems to constantly expand outwards, as we come to learn about Ararat and its scope; the second reverses that progress, drawing to a tighter and tighter focus, concluding with a family tragedy before seeming again to expand outward at the very end to the potentially infinite. The books not only create a feverish, impossible city, bigger than any city could possibly be, but then makes it credible by making it live; by making it feel like a real place, filled with real people, with intellectual movements and street theatre and folklore and competing legal jurisdictions and all the dialogue and negotiations that make a city what it is. The language is subtle but powerful, particularly in the first book where it seems every character, however minor, has an individual voice, a distinctive way of using words. Ararat has a kind of sideways relationship with actual history. You can see a familiar name here or there (Abra-Melin the mage, say), used in an unfamiliar context. You can see people or groups based on something real; a group of intellectuals struggling to put together a blasphemous atlas is a clear analogue to the 18th-century French Encyclopédistes. And sometimes a piece of actual culture is turned on its head: “Dawn is so ugly here,” comments a character in Gears of the City. “Look how the factories poison it. Those rosy fingers are nicotine-stained and filthy. They paw the horizon like they’re picking its pocket.” Rosy-fingered dawn is a phrase from Homer; the factories have poisoned the poetry as well. It’s a perfect evocation of what industrialisation does, what it looks like and what it feels like. It’s steampunk thinking. And I think one of Gilman’s great accomplishments in these books is essentially steampunkish in nature. He shows systems operating, but also shows the parts of those systems. He’ll describe a mob forming, or a social movement developing, from the outside, as a detached omniscent observer, but then will also zoom in to show individuals, to let them speak so we see how they are a part of the system, not only caught up in it but helping to form it. We see how individual situations and reactions make a collective whole, how a city is made up of its people. Certainly one way to think of traditional steampunk is as a fantasy of cityscapes. One of the effects of industrialisation was to concentrate the population in urban centres, to shift people off the land, frequently with disastrous results. A city is a complex system. It was during the 19th century that Baudelaire reinterpreted the French word flâneur to mean a wanderer in urban spaces, coming to know a place by walking it out, and we have much wandering in Thunderer and Gears of the City, much walking through space and time. Gilman’s inspired by a number of writers mostly outside the fantasy tradition, and here you can see the influence of Iain Sinclair, whose terse, dreamlike evocations of London drift from fiction to non-fiction and back; Ararat is London writ large, a Dickensian curiosity shop where fragments of meaning and history are thrown together into a wild collage. Which then makes The Half-Made World all the more remarkable, as it abandons cities almost completely. The first of another two-book series, it’s a kind of fantasia on 19th century America and on the wild west. More precisely, I think, on European ideas of America, on America’s ideas of itself; on images of industrial eastern cities and violent western heroes. Civilisation in this world existed for hundreds of years only on one side of a vast mountain range. Then, in the year 1482, a pass was discovered, leading to a western world that seems to still be in the process of formation. But settlers discovered or created a set of new Powers in this other place, notably the Gun and the Line. The Line is a Power of industrialisation; the railroad line, the telegraph line. The Gun resists the steady encroachment of the Line, fighting a losing battle; agents of the Gun are enslaved by demons, who each live in some kind of firearm. Agents are super-heroes, the American man of action and violence, strong and inhumanly fast, and controlled utterly by their demonic gun. Add to this a race native to the half-made western world, the First Folk, and a fallen Republic dedicated to democracy and opposing both Gun and Line, and you have a fascinating mythic take on the western. The imagining of race seems a bit odd at first glance; the enslaved natives are inhuman. But being both native and slave, they unify the racial injustices of the American past. They’re every Other, not just to the Gun and the Line, but to all of us. There’s no French Canada in this story of America, nor is there even any Latin America. This seems to me to be specifically an examination of America’s stories about itself, a bracingly, intellgently skeptical examination. There’s a noble democratic republic, which was founded not by a president or senator but by a general, and which survived through violence. There’s militarism — a romantic heroism viewed with a knowing eye — at the core of it. And there’s violence. Creedmore, an agent of the Gun, recalls his first murder, when blood made a “map of violence” on the floor; the half-made world is made in blood. On the other hand, there’s utopianism everywhere you look. Creedmore used to be an idealist, championing cause after cause, before selling himself into the service of the Gun. There’s a strange legend of a place called No-town, an earthly paradise. But above all there’s the device which drives the plot, a rumour of a weapon which could end the war of Gun and Line, locked away in the shattered psyche of the old general who founded the republic. It’s probably significant that the general, his mind destroyed, communicates in fairy tales; that he works the things that happen to himself and those around him into one endless ongoing tale. The book, in a sense, imagines the wild west, imagines all of America, as a fairy tale. Nor is that the only type of story in the book, which is filled with sub-texts; Creedmore’s fascinated with bad romance novels, dime novels tell stories of agents of the Gun, Creedmore himself tells his own tales of violence mixing “pride and shame, sentimentality and cynicism” in a performance aimed at himself at much as his audience. Add to that any number of excerpts read out from history texts, psychology texts (one of the main characters, Liv Alverhuysen, is a doctor from a sort of comic-opera mental hospital in the old world of the East), anti-slavery texts, telegraphs, reports, and so forth. Gilman reinterprets the myths of America in a new and no less mythic way. The Half-Made World is unobtrusively sophisticated about the narratives it’s playing with, I think. If you want to read it as an adventure story, you can do that. If you want to read it as a comment on the “adventure story” of America, you can do that, too. It’s an intensely imagined world that succeeds, I feel, at a number of levels. So what I want to say, in the end, is that Gilman uses steampunk with remarkable depth and intelligence. In his hands, it becomes a way of looking at myth. I used the word “numinous” up above, and I think the Gods of Ararat and the Gods of the Half-Made World are both solid examples of what I mean. There’s an examination of the divine, of the divine in narrative, even potentially a re-enchantment of the mechanical world, in these books. Technology, gun and railroad and telegraph, become conduits for divine and diabolic power. It’d go for nothing if Gilman didn’t have other gifts. His style, for example, is understated but compelling; vaguely reminiscent of Neil Gaiman in its rhythmic flexibility and inventive diction, its compulsive readability and narrative drive. His sense of character is strong, if tending to the larger-than-life. But I think what makes these books work is their grasp of form, the perfect fusion of what they have to say with the story structure in which they’re saying it. I have no particular reason to think Gilman will continue to work in steampunk in future; no reason to think he won’t either. But it looks as though as long as he does use the form, he’ll demonstrate what it can do. What it’s capable of. Which ought to be justification enough for any critic. What a fantastic post. You’ve succeeded in interesting me in Gilman’s work and you’ve done an excellent job discussing and defining steampunk. I’m right there with you about the worth of adventure fiction. I thought the various factions of spec fic were past wars over the worth of genre and that people saw there was plenty of room at the table for different tastes. I’m certainly weary of seeing adventure fiction get kicked around. Thank you, Howard! I hope you get a chance to read and enjoy Gilman’s work. I was surprised to see Valente write what she did about adventure fiction. Not least because I read her book The Orphan’s Tales: In the Night Garden, and parts of it at least seemed very much like adventure fiction to me.